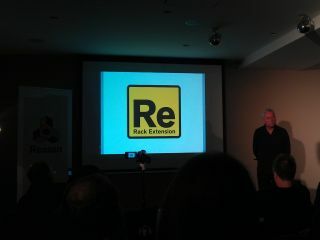 MUSIKMESSE 2012: As you may have heard, Propellerhead Software made a couple of major announcements last night. First up, it introduced a new iOS app called Figure, while Reason fans learned that the new Rack Extension technology will enable third-party developers to create devices for their DAW of choice..
All the details were revealed in a press conference, which you can watch in the video above. The official Reason Rack Extensions press release is below. There's more information on the dedicated Rack Extensions page on the Propellerhead website. Propellerhead introduces Rack Extensions: a new technology that opens up the Reason rack, enabling third party developers to create instruments and effects for the award-winning music making software Reason. Through this new technology—built into the next version of Reason and Reason Essentials—users can expand their collection of instruments and effects with the Reason devices they want. "Musician's from all corners of the planet keep telling us that Reason is the best thing that ever happened to their musical creativity," says Ernst Nathorst-Böös, Propellerhead CEO. "With Rack Extensions we rocket it into another dimension, by inviting a world of creative and talented developers to bring their designs to the Reason rack. Rack Extensions have everything you love about Reason, from the cables on the back and integrated patch browser to its world-renowned stability and ease of use". Available to third parties as a software development toolkit, the Rack Extension technology is not just another plug-in format. Rack Extensions are full Reason rack citizens, giving users the same great experience with third party extensions as with any other Reason device—including the ability to load them in Reason's Combinator, route audio and CV cables on the back, automation of all parameters, copy/paste devices and signal chains, and experimentation with the safety of unlimited undo. Propellerhead also announces the Rack Extension Store, an online store where Rack Extensions from all Rack Extension developers can be purchased and downloaded directly into the Reason rack, as many times as needed. All Rack Extensions are Mac and Windows compatible, and can be tried with users' own song files in Reason before purchase. The automatic installation and authentication ensures that users keep the focus on being creative and finding the right sounds for their music. The Rack Extension technology will be introduced in version 6.5 of Reason and version 1.5 of Reason Essentials to be released in Q2, 2012. The upgrades will be available for free download for all owners of Reason 6 and Reason Essentials. Users of previous versions of Reason can upgrade to Reason 6 today and download the upgrade for free once it becomes available.